A genuine guitar icon: as rewarding to play now as it’s ever been. When you think of the most iconic acoustic guitars that have ever been played, chances are that most people would name-drop one of the obvious contenders from the likes of Martin or even Gibson. Real American icons that have stood the test of time and provided the sounding board for some of the greatest tunes ever penned on a six-string. 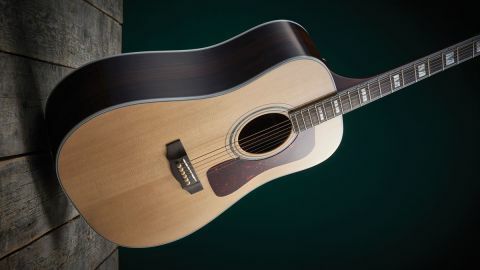 One such guitar that perhaps doesn’t get the recognition it deserves, though, in some circles is Guild’s D-55, the company’s flagship dreadnought, beloved by the likes of Tommy Smothers, Waylon Jennings, Billie Joe Armstrong and David Nail, to quote guild’s own website. Truly, the humble dread has proved so many times to have been the backbone of modern music across a multitude of genres, and the D-55 is Guild’s ultimate vision of that iconic design. Packing in high quality tonewoods, expert craftsmanship and carefully chosen luxury appointments, the D-55 is bound to make an enticing prospect for any fan of the slope-shouldered strummer. It really seems as though Guild has gone all-out with every possible element of the D-55. For starters, the supplied hardcase comes wrapped in a gaudy, but oh-so-American faux alligator skin. Once inside, a humidifier is revealed in the top section, while the D-55 sits snugly in luxurious green, velvety padding. As for the guitar itself, the tonewood combination is the classic mix of a AAA-grade sitka spruce top partnered with Indian rosewood back and sides, while internally the guitar features scalloped adirondack spruce bracing. The body connects to a mahogany neck via an improved dovetail joint, and also manages to sneak in a strip of walnut up the length of the mahogany. On the reverse of the neck is a uniformly dark ebony fingerboard topped with 20 frets. While we’re there, we have to pause for a moment to mention that the frets are the only part of the D-55’s construction that we can objectively criticise. While there are no sharp edges or anything like that, we did personally find the frets slightly scratchy in use. Not overly so, but for our money it’s still a rather considerable setback on a guitar that commands such a high price. We’ve played cheaper guitars with better fret polishing this year, and that just shouldn’t be the case at this level. Hopefully it’s something that is isolated to this one example, but we’ve got to note it down regardless. Leaving that issue to one side, much can also be said about the visual aesthetics of the guitar. The nitrocellulose gloss finish is perfectly smooth and expertly applied across the entirety of the body and neck. The golden gotoh open gear tuners and inlay work on the headstock and fingerboard is far from subtle, but there’s no denying that there’s a real Gibson-esque American charm to it all - if you’re a fan of the look then you’ll be very well catered for here as the quality of the workmanship is sublime. The binding is very smart too, offering a crisp, pinstripe black and white outline over every curve and edge you can find. There’s also a lovely woodwork embellishment working its way up the middle of the rosewood back. There aren’t any electronics included on the example we received for review, but the option exists for fitting an LR Baggs Anthem if you’re so inclined, and yes, that’ll cost you extra. Overall, fret finishing issues aside, we can’t help but be impressed by the detail and workmanship that has gone into the D-55. If you’re a fan of decorative, American-made acoustics then there’s plenty to love here and you’ll enjoy admiring all those little touches every time you pick up the guitar. It might not be the ideal look for minimalists, admittedly, but there’s plenty of choices elsewhere for that style of instrument. Dreadnoughts have a reputation for being keen strummers and all-rounders, and the D-55 fits the bill here as well as any dread we’ve ever been fortunate enough to play. From the first note you can really hear the character of the woods shining through in a way that’ll immediately transport you to your favourite ever songs. The tone is as clear and balanced as you like, with the rosewood adding a beautifully defined bass response to the sparkling, harmonic-rich highs of that high quality sitka spruce. For all the definition and detail to the voice, it never sounds sterile - there’s real character to the tones that offer plenty of sustain, projection and volume when played hard, but the subtlety is also there for when you need to quiet things down and get a little bit more soulful. With that in mind, it’s also worth mentioning that the D-55 also makes a good fingerpicker, with a certain plumminess to the lower strings under the thumb that makes it ideal for bass lines, while your other fingers coax out moreof those delightful highs from the upper strings. The neck profile is rather flat though, so depending on your preferences you might feel that the area around the nut (which sports a 43mm spacing, for reference) feels a little restrictive at times. That’s subjective though, so for the time being let’s just say that tonally, the D-55 sounds the absolute business. There’s no denying that the D-55 is a superb guitar, and Guild should rightly be commended for the superb craftsmanship on display. Tonally, the guitar is the quintessential dreadnought - balanced, powerful, versatile and utterly infectious. The kind of guitar you can easily lose hours and hours of playtime to without so much as a second thought. Whatever way you swing it, this is an expensive guitar, and anyone spending this much money should expect perfection. We haven’t quite experienced that here, and for that reason we’d suggest anyone out there that has fallen for the Guild’s obvious charms try it for themselves. If it’s the instrument for you, we suspect you’ll know very quickly, and that you’ll have a very difficult time putting it back down.